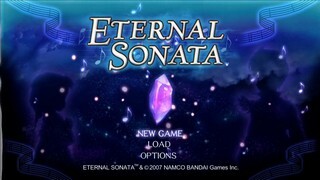 Released in 2007 for the Xbox 360 and 2008 for the PS3 by Tri-Crescendo, Eternal Sonata is a role-playing game where you explore a fictional dream world conjured up by famous pianist and composer Frédéric Chopin on his death bed. He's a playable character. In his own dreams. How meta is that? Best European version time: 2:55:12 by 'zxcvalor' on 2013-06-25, done in 49 segments. My comments come in the form of a brief Q&A. Thank you all for watching! Sir VG & ciddypoo from the sda forums - for showing interest in my run and in this game. ElevenFour and DomZ Ninja - for their guides on gamefaqs, especially for the great maps. Tri-Crescendo for making this wonderful and very enjoyable game. Q: Hey, why aren't you running the PS3 version, it's harder and has extra content? and I wanted to come back to the same game. Q: Wouldn't an RTA run be much more interesting? Q: Which characters are you using? chapter 6, her arrows deal huge damage. Q: Do you need to level up at all? Q: How did you handle making money? photographer there for ~11k each, giving me ~90k overall, which was sufficient. Q: What is Hawk Eye? Q: Why are you making big detours to pick up poison whitecaps? sometimes just a bad idea. Q: What kind of items are you setting? they take up a lot of inventory space and also a lot of turn time to use. allowing you to quick flee from some battles where you would otherwise have to wait for the enemy's turn. Q: What were some of the harder parts of the run? the enemy dodging is very time consuming, for example the long run to Forte in segment 10. Q: What's up with all the random encounters in segment 16, were you having an off day? Q: What were some of the bigger mistakes you made in the run? A: Stopping to purchase Scorpion's Tails in Baroque turned out to be a waste of time as they were never used. if this works everywhere. The loading time doesn't go on the clock, so this is not immediately useful. positions, and you can use try this technique if your path is continually blocked in the same manner. For example, I quick loaded at the beginning of segment 14 to get through the first few scorpions.